Is a Reptile Right For You? Ever Considered Adopting a Reptile? When bringing a new reptile home, it is good practice to quarantine it for a few months first before moving it into its permanent residence. The reason for this is to allow you to easily check if the reptile is harbouring any diseases or parasites, quarantining will also prevent the spread of infectious diseases to other reptiles in your collection. Newspaper or kitchen towel can be used as a substrate with lizards, tortoises and snakes, astroturf for amphibians. By doing this you can check if the animal’s faeces are normal and not runny, containing parasites or containing bits of substrate which may indicate that the animal is impacted. You may also check the faeces for undigested food which will show if the animal was previously kept in improper conditions or fed food of an inappropriate size. Using newspaper or kitchen towel as a substrate will also allow you to easily check for mites and other external parasites. All reptiles should be given time to settle in to their new surroundings to make the transition into their new home as least stressful as possible, this is the time when reptiles often refuse to eat and are at most risk of suffering from high levels of stress. The settling in period should last around three weeks. During this time there should be little to no contact between the reptile and keeper, only disturbing the animal to feed and change its water. 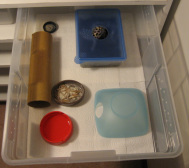 This will help reduce stress and give the animal the time it needs to calm and settle in. The enclosure should be placed in a low traffic area where it is not likely to be disturbed by passers-by or excessive noises from the television, people or other pets.